After a short delay, another year, another list. As with last year, these are in no particular order and are a sampling of games I considered exceptional and had something to talk about in the last 12 months. The aim is to only talk about games first released this year, but rules can be bent when required. And this is why rules are made to be broken. This had only been out for weeks when the end of last year arrived and I was awaiting a good deal on getting a current gen console (and making sure it wasn't going to be another PS2 vs xbox/GC generation where the weakest platform gained traction and a lot of exclusives). But, on getting round to exploring this release shooter, I found far more than I expected. Here you can find most of my thoughts on how this game seems created for PC shooter fans who have, over a decade after Halo provided playable joypad controls, become comfortable playing without a mouse when required. It's a varied (gameplay and visual) experience that rarely drops from being excellent and which can be taken as puzzle combat encounters (similar to F.E.A.R.) by those wishing to push the difficulty up. And it's currently sitting in bargain bins for anyone with a PS4 to pick up. This was the year where the most direct sequel to the PS3's inFamous games, mechanically, was an Xbox exclusive from the guys who made Ratchet & Clank. I guess that's not such a strange thing, being that we're talking about a series that grew out of grim-dark'ing the 3D platforming of Sly Raccoon. 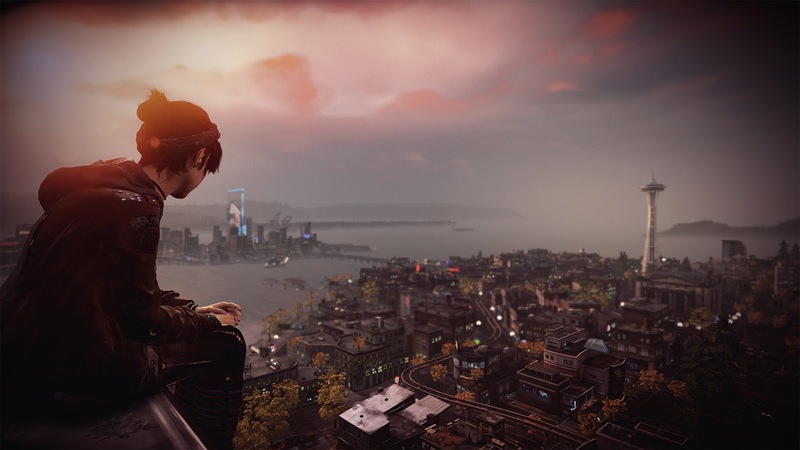 The interesting point is that inFamous, while jumping to a fictional Seattle, reinvented their super-mobile open world shooter design to no longer be about grinding rails on your electrified shoes. The new game and standalone expansion steps away from Cole and crafts a thoroughly new space with mobility extended to holding a button and pointing where to go (a power that becomes more super as you upgrade it). With the compact story length (with enough to do to 100% the world without it ever feeling like a major distraction) of about 10 hours, this is an open world for people who may not have enough time to play open world epics. During that time you'll unlock four skill trees and power sets with their respective mobility boosts to develop, ensuring you can almost teleport around the map. You also, via completing secondary objectives in each area, get access to an actual fast-travel teleport but I didn't find it was something I used more than a few times when I wanted to jump between the two islands. This isn't a completely different genre, in the same way you'd not expect an F.P.S. series to drop the weapons completely, but it has shaken things up. The main peashooter is completely different depending on the good/evil unlocks and which element you've switched to (with recharge points in the world acting as where you also switch your weapon set), as are anything more than the very basics of what most weapons do. You've usually got a grenade but they can be stasis grenades to freeze enemies for precision shots, or smokers to allow you to get up close for melee finishers, or a burst shock cone attack, or even not grenades at all but a cloaking ability. You usually get to pick the element you want to be running with for most encounters and the compact play time means you're constantly unlocking the latest element and the skill tree perks. For the expansion the developers cut back to half of the city (with some minor tweaks to keep it fresh), fix you to a single powers set, remove the good/evil choices, and created a prequel campaign that lasts about half the length of the full game. The shocking thing is how they manage to redesign the Neon power set to feel completely fresh, while still somewhat similar to the power it turns into in the main game, and update the traversal mechanic with a "boost gate" system that makes getting around feel fresh again. The sparse use of cutscenes and length (along with mainly taking place in the same city) indicate the constrained budget, as does the addition of an (score attack) arena mode that locks some of the skill tree behind completing challenges. But the expansion stands on some new powers and secondary objectives as more than just more of the thing you've already played. I've always enjoyed the simple, comic-book-used-as-disparaging-shorthand (which would once have probably been called pulp) stories told in the inFamous games and this one is no different. Don't expect anything beyond dirty halos and demons ripping justifications for their horns out their arses. The player choice (when employed) is saving or burning orphanages so it's best to consider it two stories rather than a choice each time you're asked to pick a side (the upgrade system reinforces this point). This isn't a Bioware RPG but rather a single story in which destiny will force both good and evil players to experience the same beats. I've enjoyed playing these games twice because of how they tell two stories with the same beats but this isn't the strongest in the series for that (which makes the loss in the expansion less of a downer). Going into the games with your eyes open about the quality of the story told, even with top notch mo-cap and presentation and some decent work on the actual lines of dialogue, avoids disappointment. Sucker Punch know what they want to say and they say it, even if that mainly involves well-worn characters and tropes. That said, it was a missed opportunity when they cast two Texans as the voices of the Seattle Native American Rowes. While no one ever talks about it (item 3), people are starting to make games about it (and so talk about it). How Do You Do It is a free gamejam game that only takes a few minutes to play. It's a short, a statement, an offer to see the world through someone else's eyes for a few moments as they revisit their past. I played a lot of good, short games that took an introspective view of the author(s) and their past(s). This one stood out as a great example of what democratisation of a medium can provide, when this didn't require a man-year of work to be produced and spur discussions of SRE and childhood. 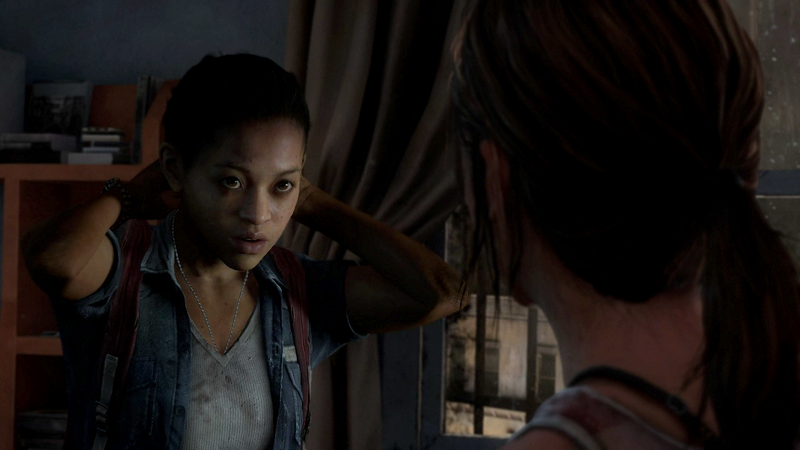 The Last of Us didn't need any more content. It was a great game last year, but this year it got a 1080p treatment on PS4 (something us PC players just expect games to do over time for free as we upgrade our hardware - most of my PC games will be running in 4K in the next decade, if they don't already). It also got a new chapter, which worked out beautifully as an episode to introduce Ellie as a playable character long after we'd already been introduced. Once again, Naughty Dog crafted a cinematic narrative onto which I projected the characters I knew (although Joel doesn't have much to do except lie in pain due to where this fits in the chronology) and was swept away by the stories this universe had to offer. As the chapter ends on two girls waiting to lose their minds together, this added chapter becomes an essential addition to the narrative, giving those words a punch they didn't have when originally used during the ending of the main game. Some of the games on this list are just great or fun, Left Behind is essential. A steampunk visual novel for the phone where some choices are timed so you can't dally thinking about what to do next and can lose time as seconds burn hours. You probably already think this is a terrible game that no one should play. But it turned out to be one of the best written pieces of fiction I read all year and far more of a game than the visual novel framing might suggest. While there are times when it is very much a visual novel and relies on excellent writing, there is also a range of play and direction as you choose how to go that makes this feel far closer to a Fighting Fantasy book, or a Persona game without the dungeons (if that's your reference point). Blizzard know how to make games, and they took what they learned from partnering for a collectible card game around World of Warcraft and created an online game that's not quite as exploitative as a CCG but not too far off. The drafting game, called the Arena, is the main meat of the game for me. So far I've managed to avoid diving too deeply into the constructed decks but I'm constantly getting new cards via Arena play. You probably already know if you've got any interest playing something without the mechanics complexity of Magic: the Gathering but this certainly provides how you can streamline that sort of game to keep the pace fast (at the cost of some of the depth). This game is funny. Properly, laugh out loud, funny. It has enough gags that not every one needs to hit and understands when it's time to wrap the game up and go home. Between the open and close, you'll rush around an almost nonsensical spy adventure in the future-past, unravelling a world that knows how to be absurd without being random. It's not perfect, but you're really missing out if you've not given this a shot. They took Hitman and extracted a lovely (clockwork) board game puzzler out of the elements of those more free-flowing, puzzle stealth, assassin simulation games. Then they managed to showcase the power of the mobile SoCs to render that board game to play on your tablet. There's not a lot to this, but it's one of the best things you could play on your mobile this year and I kept going back to crack a few more puzzle boards. More importantly, it wasn't just a short reskin of echochrome with some clean UI choices and it very much avoided being another Squidix attempt to exploit their IP on mobile. The team that made this game cared about Hitman and did a solid job making something perfect for mobile. You Don't Know Jack has always been good (but never as good as the one UK edition voiced by Paul Kaye) and this box of incredible value bundles the latest edition of that with takes on charades-derived stuff similar to games like Balderdash. The genius move is that all games are run via a web service so, rather than controllers, you just need a mobile device with a browser to join the game. Everyone draws their word on their device in Drawful and then everyone names the pictures to create a set of potential right answers from which everyone picks (so kinda Pictionary). Write down the missing word or question answer in Fibbage XL and then try to guess the real one from everyone's choices (so kinda Balderdash). It'll eventually run out of fresh questions and words in each of the games but it's a great bundle for having a bit of fun. This game launched broken. The online crumbled and reminded us why always-on DRM is something to avoid, as those of us playing got to dive into a career mode and unlock cars while justifiably complaining that the leaderboards, challenges, and online weren't working. They eventually got all that stuff working and added in the changing weather conditions that make this the best looking console game released this year. It's no Forza 4 but this is a solid racer that splits the difference between the soft-sim of console sim games (your TOCA series etc) and the sort of arcade game where the brake is more optional or engages the drifting mode. Beyond the entry tier cars you'll need to constantly be considering how far you can push the throttle, and braking is a matter of how strongly you can apply them without the scream of tyres indicating you came on too strong. But those brakes decelerate you far faster than they would in a soft-sim when applied correctly and this, combined with higher cornering speeds, gives the game a distinct feel you have to adapt to. Keep your soft-sim mentality, but compress those braking zones down. Outside of the unusual driving model, the micro-challenges stuff that they layer onto the track sections is where this game finds new ground. As you're driving along, be that a race or a hot lap, the game will add in challenges on sections of track (as small as a single bend) and pick out a target that it thinks you can beat. Effectively every corner you're driving when online, you're putting up dynamic challenges for the game to pull from to challenge someone to beat your score. Average time, top speed, following the lines through the corners, getting a higher drive score, etc. Even if you've lost sight of the goals you're driving for (the campaign sets a series of goals for each event) and are just learning the track before you try again to get that top 3 finish or nail a lap time, the game will look for some suitable challenges to keep your drive fresh. There is also the standard race/lap/event leaderboards and you can send challenges to your friends to compete in, selecting from your recent races and drilling down to an achievement (eg hot lap time) for other to beat within the next X days. 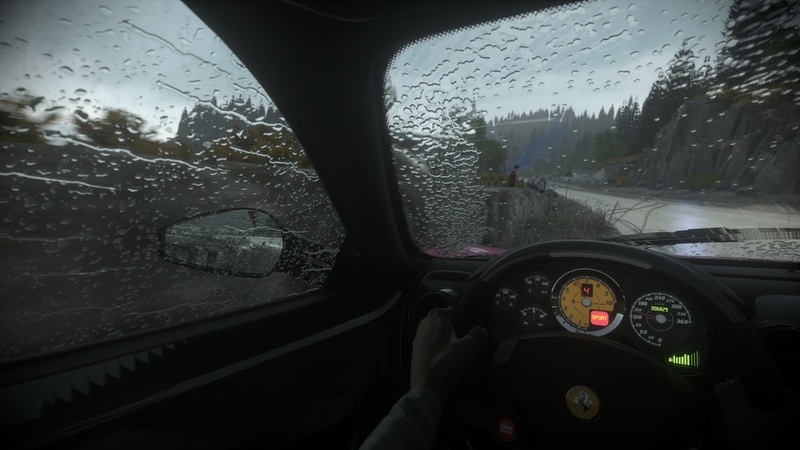 The lack of functional online for the opening month or two really harmed the areas where DriveClub stands out. Beyond the antialiased 1080p rendering of five interesting locations with over ten tracks per location, the day-night cycle (which you can set to compress to an hour per minute raced) leads to races that don't feel like the same lap over and over, beyond the dynamic challenges. Add in snow and rain coming or going as you play and that illuminates where you can see the design intent of this game. Just because you started a race in the Sun, doesn't mean you're not looking through a storm of snowflakes, illuminated by your headlights, at night by the time you're finished. You can lock it down to give you something to learn precisely but the game excels at making sure every lap can feel a bit different to keep you on your toes. As this is (when in a racing event) more of a racing game than a driving game, the A.I. is important. There is a bit of push and pull there, and you see some A.I. ahead making a mistake and losing traction as they drop two wheels onto the edge of the track here and there. They're 'boisterous', if you're going much slower than them then they will try going through you or push you too fast for the next corner. They might give you a gentle nudge as they complete an overtake, but not often. They're basically 99% less annoying for your day than human opponents but anyone who has seen an A.I. get totally out of their depth doing an overtake attempt and spin their car will recognise this isn't the classic on-rails design (despite what some reviews said). They just don't really care about rear-ending you if you slow down too much, which is reinforced by the driving model that only penalises really blatant "braking by impact" (with a specific penalty that locks you in 1st gear for a few seconds when you get caught). The game passes the family fun test, with the dynamic challenges always looking to give even the slowest players something they can beat and a handling model slightly more forgiving than Forza, all while showing off what this current generation of consoles can render as you rush round diverse, ever-changing tracks. Probably the silliest game on this list. 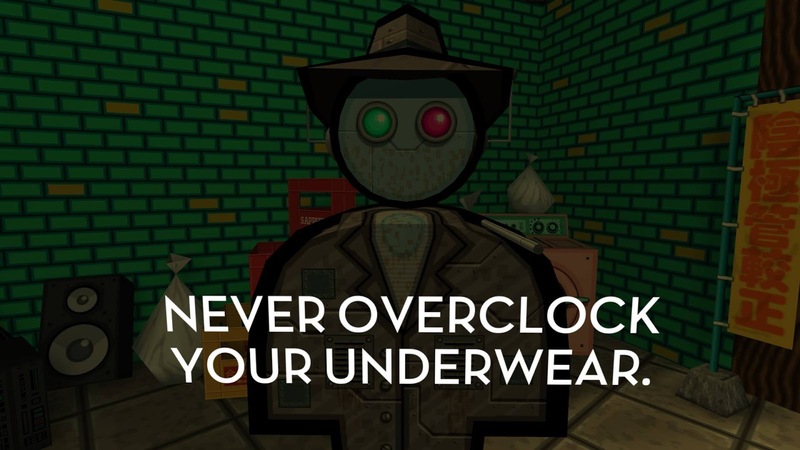 This is a joke that, unlike Jazzpunk, can go on a bit too long. But, as an open world with very little flagged as actual mission content, this is something to wander around and enjoy the absurdity of, until you've caught a few Easter eggs and then shut it down. After the game exploded, the devs have added new modes, new whole open worlds to explore, and so on that have bulked out the offering so you're not going to get bored in the first hour. That expanded content, for free, is what pushes this from an amusing hour-long joke into a game worth mentioning in the same year as the sublime Jazzpunk. This was the year I put 60+ hours into Planetary Annihilation, the game that took up the massive battles and rate-based economy RTS mantle of TA. Played on spheres, with great area-selection and UI tools to refine that formula closer to where it really needs to be for a contemporary game, this should have been a shoo-in for the list. But the game balance fell short, the A.I. fell short (crucially in what could have been a very interesting roguelike-like repeatable campaign mode), and the KickStarter talk of DRM-free that turned into a post-release patch to remove the always-on server connection requirements felt like the developer was abusing the label, not embracing the idea. It's still the best rate-based economy RTS to play and something every TA fan should pick up (in the $5 or less sales that it now regularly dives into on Steam) but it's not a GotY contender. Speaking of gaming dynasties, Forza Horizon 2 feels more devoid of life than the original, certainly a weaker sequel (to a game I didn't put on my list in 2012 but this year was more scarce for good cockpit driving games) based on a few hours of play. Any more and I'd need to buy my own Xbox to play it on and I certainly don't like it enough to pay for another console when the one I got came with 50% more GPU, widely the same game selection, and basically the same sticker price. This year also produced some great demos, a couple that were seemingly totally unconnected to the games they are advertising. You should look out for good things in 2015 from a host of titles in early access or on partial episodic release right now, and if you've not played P.T. this year then you missed out.